Shayari for Republic Day | If you're here looking for Shayari collections for this 26 January to wish your friends then you're at right place. Here I've posted several Republic Day Shayari on patriotism and on veterans(shaheed). This 26 January celebrate this day posting these shayaris on your social profiles. 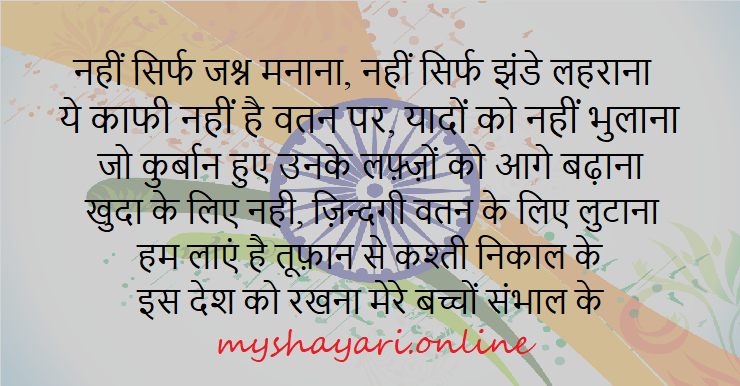 So these were popular republic day 26 jun shayari, i hope you enjoyed this collection and shared this collection with your friends. You can read our other collections at myshayari.online and you can bookmark this page so you can visit it next time without searching anywhere else. You can comment down below to wish our reader for 26 January.